provided the USA’s only medal on the men’s side, winning the silver. Gold was taken by Zoljargal Ulziisaikhan (MON) and the bronze went to Fausto Gobbi of Italy. The middleweights also included Bradley Sutton of MTV's True Life: I'm A Sumo Wrestler. In both professional and amateur sumo, Mongolians currently rule the roost. In Japan it is yokozuna Asashoryu and in amateur sumo, it is the current world champion, Byambajav Ulambayar (formerly Daishochi). Organized by the California Sumo Association (http://www. usasumo.com), the 7th Annual U.S. Sumo Open took place in Los Angeles, California, USA on Saturday, April 7th 2007; and once again, Ulambayar (“Byamba”) proved too strong for the competition, winning both the men’s heavyweight and openweight divisions. The US Sumo Open has grown in stature over the years, and though the sumo may be amateur, the sponsorship of companies such as TV Japan, Sapporo and Hakutsuru Sake, as well as the support of the Consulate General of Japan and the Los Angeles Mongolian Association testify to its place in the world of amateur sumo competitions. Staged at the Los Angeles Sports Arena before an enthusiastic crowd, this year’s event was again a truly multinational affair that featured rikishi from many countries, including the USA, Mongolia, Bulgaria, Norway and Italy. each bout is started on the referee’s command. Very importantly, amateur sumo is a sport in which women compete and excel. In men’s lightweight, Munkhjargal Ulziibayar (MON) provided what might be considered an upset by defeating Erdenebileg Alagdaa (MON) to win the gold. This was Alagdaa’s first defeat in 2 years of competing at the US Sumo Open. Valentin Gogov (BUL) won the bronze. 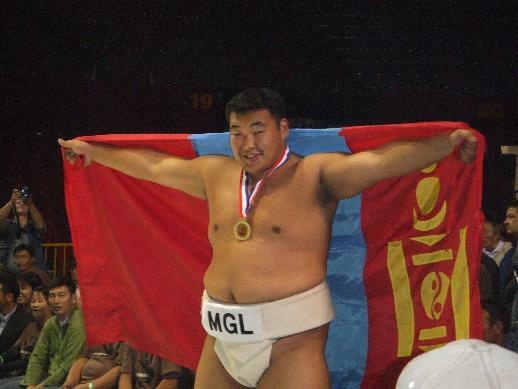 World and 2007 USA Sumo Open Champion, Byambajav Ulambayar of Mongolia. turned into an anticlimax when Byamba won by henka and hatakikomi.